There are two basic types of outside mount chimney caps – those with a metal skirt that attaches to the sides of the chimney and those with an adjustable band that goes around the chimney and tightens at each corner. 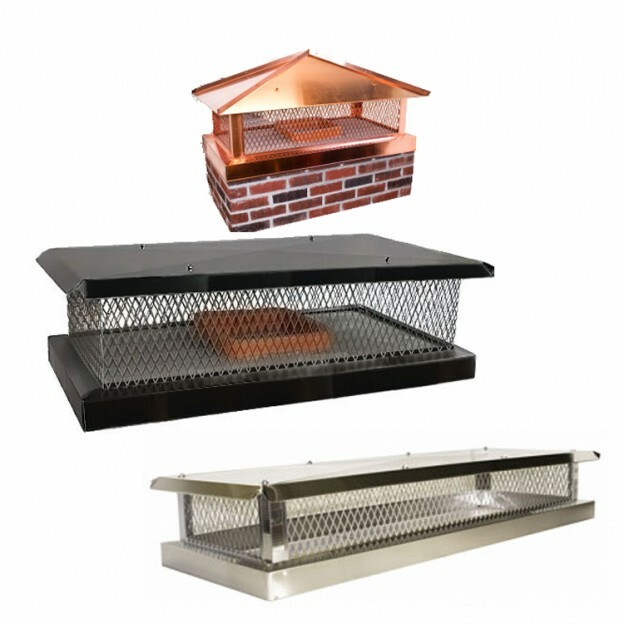 Almost all outside mount chimney caps are custom made to dimensions you specify, in the metal of your choice, and with the lid style you prefer. Outside Mount Chimney Caps are appropriate for single flue and multi-flue chimneys of any size. These chimney caps that mount to the sides of the chimney itself are not appropriate for Air-Cooled Flues (flues with two or more concentric pipes with air between the pipes.) Use Air-Cooled Chimney Caps for those flues. Stainless Steel Band-Around chimney caps are appropriate regardless of they type of fuel you use. Aluminum Band Arounds, however, are not appropriate for oil appliances or if wood is your primary heating fuel. 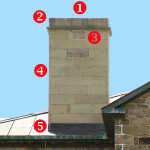 To measure for an outside mount chimney cap, find and write down the length of the longest side and then write down the lengths of the remaining three sides, going clockwise from the longest side. Also measure the height from the top row of bricks to the top of the tallest flue. Except with the Band-Around style, the chimney caps can be made with lids of any pitch between 3/12 (14 degree) and 12/12 (45 degree). Many people choose to match the pitch of their home’s roof. In areas with lots of heavy, wet snow, pitches 10/12 to 12/12 are best for shedding snow. Traditional Outside Mount Chimney Caps are available in copper or in stainless steel . The stainless steel ones can be powdercoated with a baked-on, exterior grade paint finish, such as brown or black. Band-Around style chimney caps come in aluminum or stainless steel. 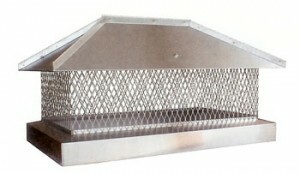 You can have a traditional outside mount chimney cap made with the standard 3/4″ mesh or with California small 5/8″ mesh . California code requires the 5/8″ mesh. 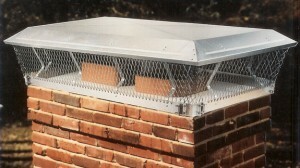 Band-Around chimney caps are only available in standard mesh. If you live in any area with a fire hazard, choosing 5/8″ mesh is a good idea. Stainless Steel and Copper Outside Mount Chimney Caps have Lifetime Warranties!